Welcome to the first entry in our new series: the Northridge Archives! 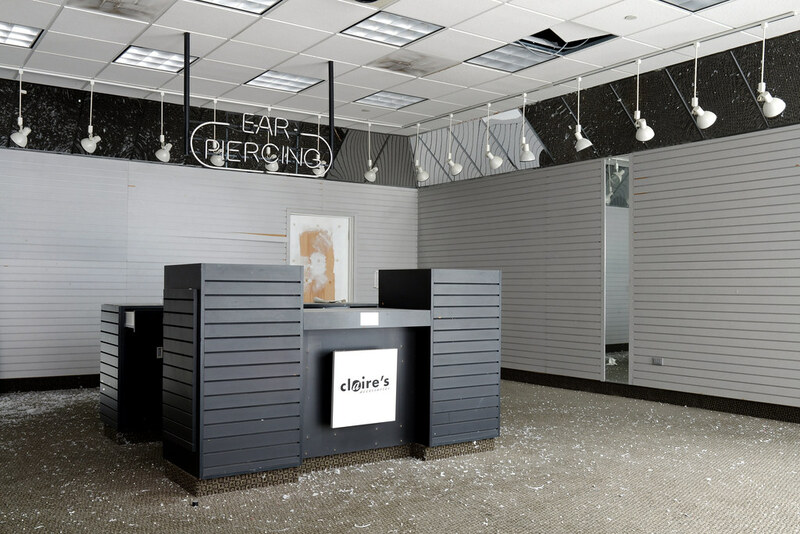 Last weekend we completed our third and fourth raids on Milwaukee’s notorious Northridge Mall, which has been abandoned and locked-down with minimal access since 2003. Today it is still rather difficult to crack, however we’ve found an easy-in through airsoft events being hosted at the property twice a year (with much thanks Mir Tactical for putting up with us throughout the morning; and local cat, Nick Pelant, for coordinating everything). Shooting and serious looting was on the agenda this go-round. 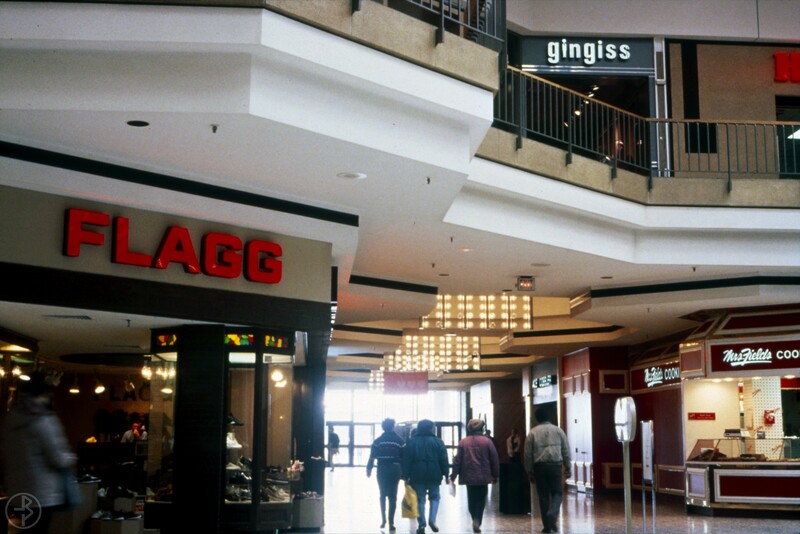 We documented much of the mall and its preserved 90s (some older) storefronts on the first two trips, but upon finding a spike in vandalism (damn firebugs) since our first trip: decided the time to rescue anything and everything worth preserving was either now or never. We were originally going after the usual lootables – signs, blueprints, etc. – but there was one unexpected perk to the vandalism… a couple of locked rooms in the management offices had been broken into. One of which happened to be a storage area housing (among other things) a massive cache of the mall’s photo archive — slides, negatives, prints, binders, framed work… you name it. Oh hell yes, we pillaged all of it! 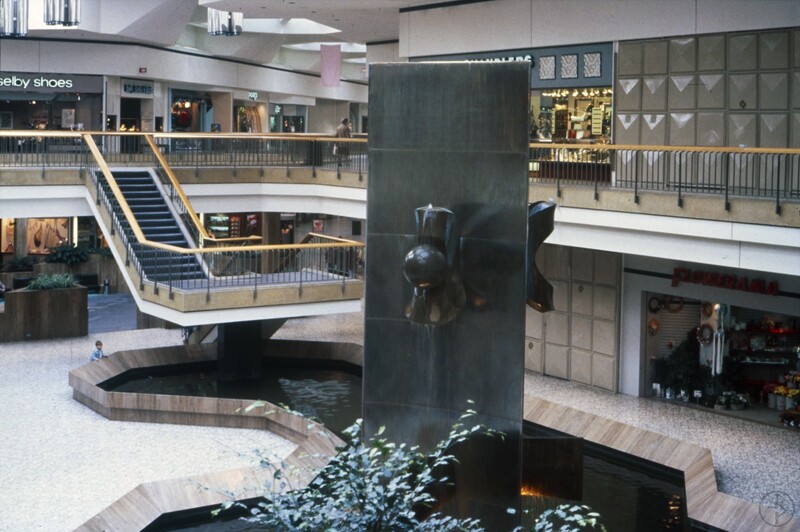 Having now weeded out thousands of blurry event and display case photos, we’ve begun digitizing the keepers which show the mall around the 80s and early-mid 90s. 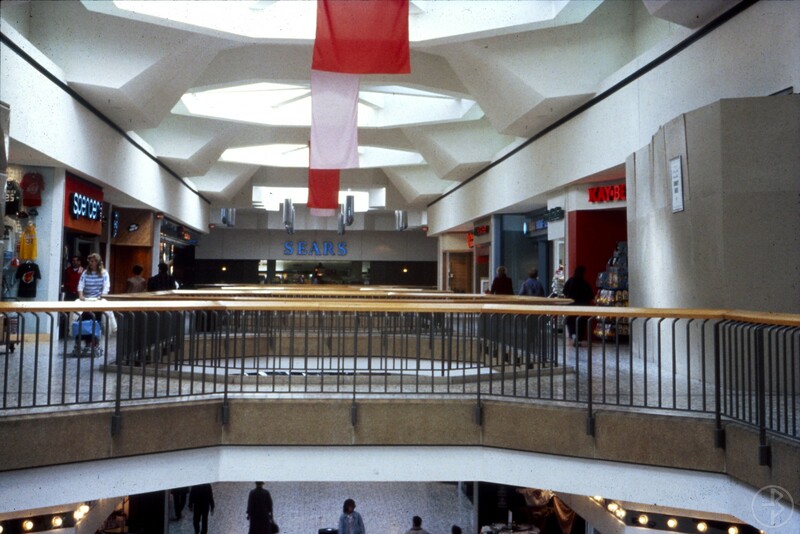 This entry is the first in what will be a series of those images; a collection that illustrates not just Northridge in its prime, but a time when malls were exploding as the new economic, cultural and social gathering places of American suburbia. This particular batch comes from a box of loose, assorted slides. 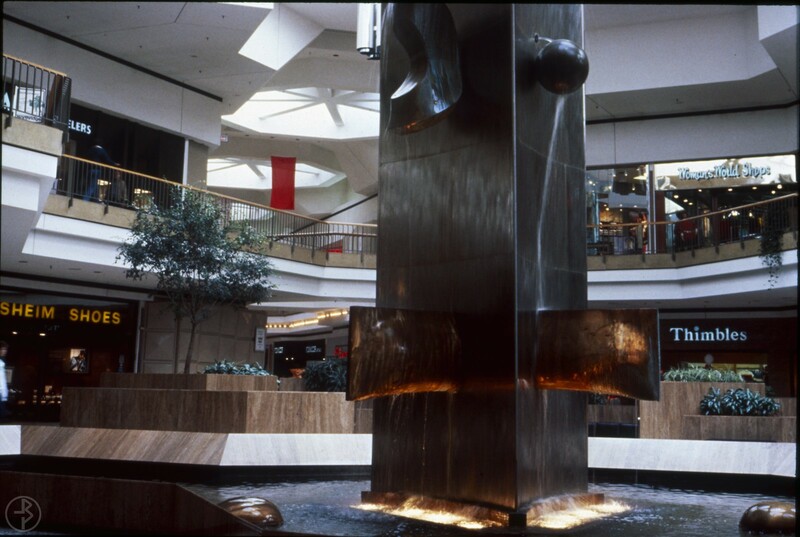 The focus seems to be on architectural features that were original to the mall’s opening in 1972, primarily the fountains and granite features in the center court, as well as the chrome light fixtures that used to hang from the ceiling throughout the mall. 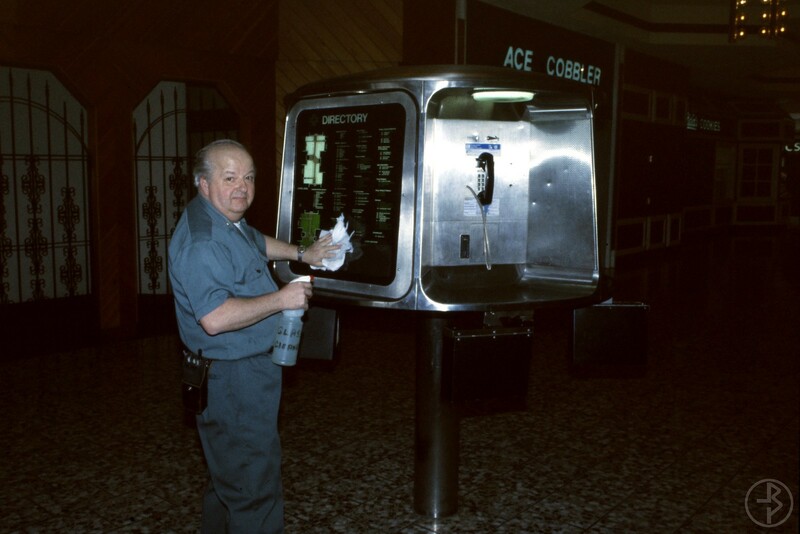 These would all disappear in a $6-million renovation project that was completed in time for the 1988 Christmas season. 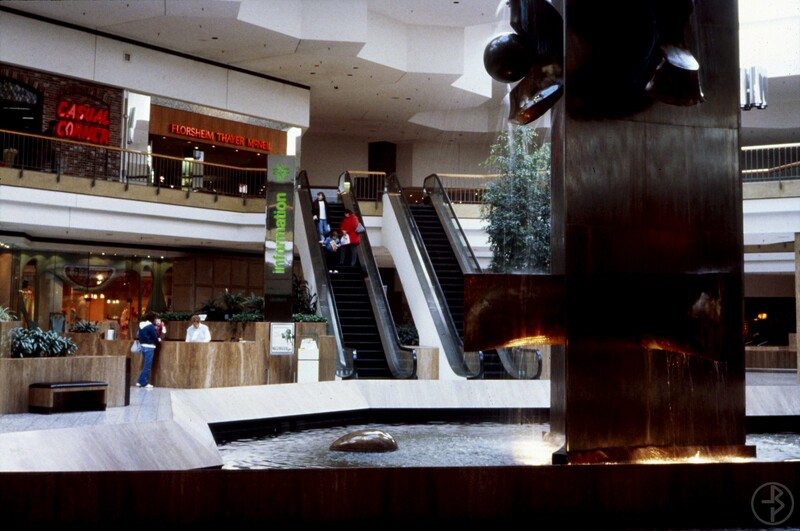 Paired with the mall’s short-lived Marshall Field’s anchor, and what looks like red Valentine’s Day decor draped from the ceiling: I am figuring the bulk of these were taken around February between 1986 and 1987, as part of the design phase for the following year’s remodel. I’ve included a handful of older slides that were from the same pile, likely additional reference photos pulled and lumped into this batch by management. They show a few minor changes that took place before the rest of these photos were taken. 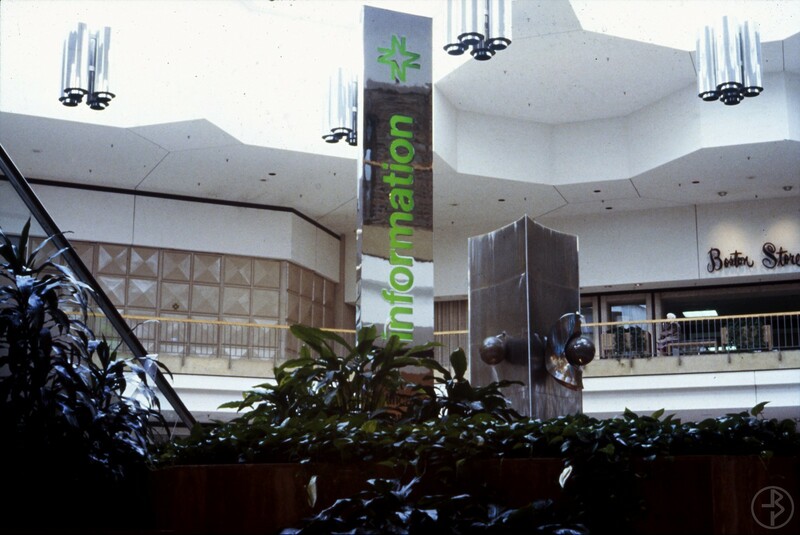 The mall’s original center court featured sunken, carpeted seating areas, planters, a stage, water features, and an information desk capped by a towering, chrome vertical sign. 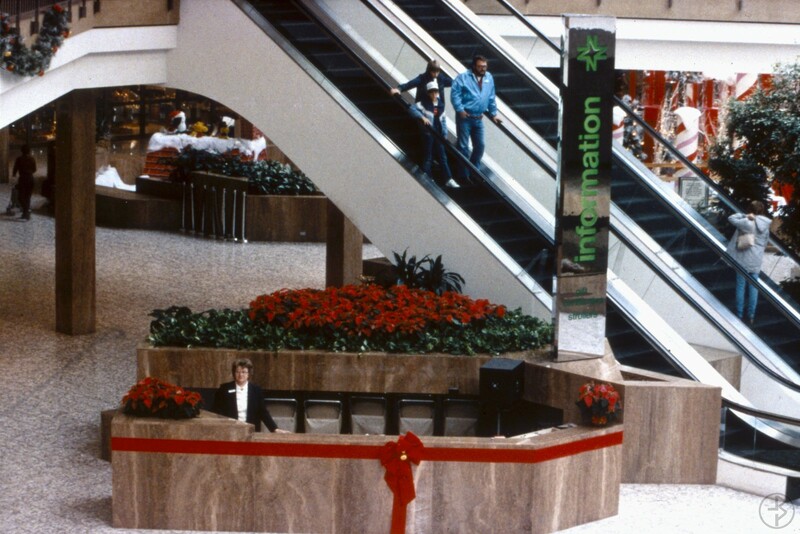 This would actually be the mall’s second info desk, with the original being a more temporary structure – shown in the final two images of this batch. 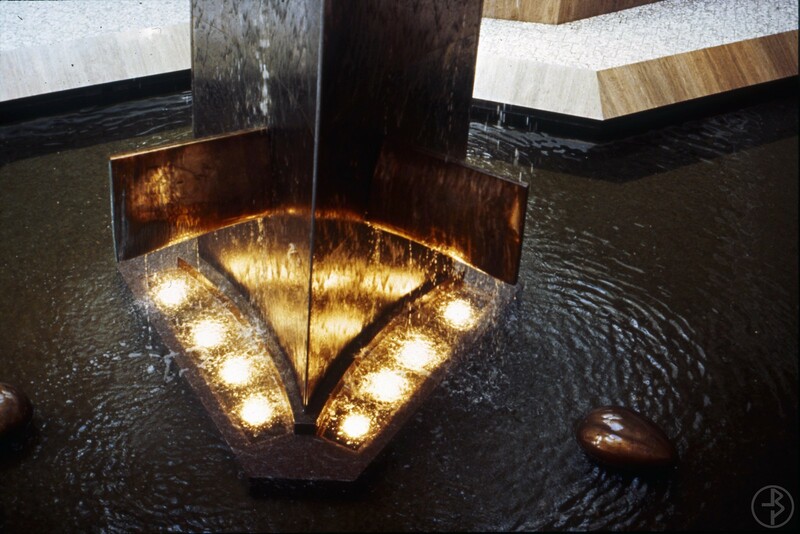 Its centerpiece, fronting the Boston Store anchor, was a 24-foot abstract tower of polished stainless steel rising from a pool, with water cascading onto various bronze shapes jutting from the sides of the tower. 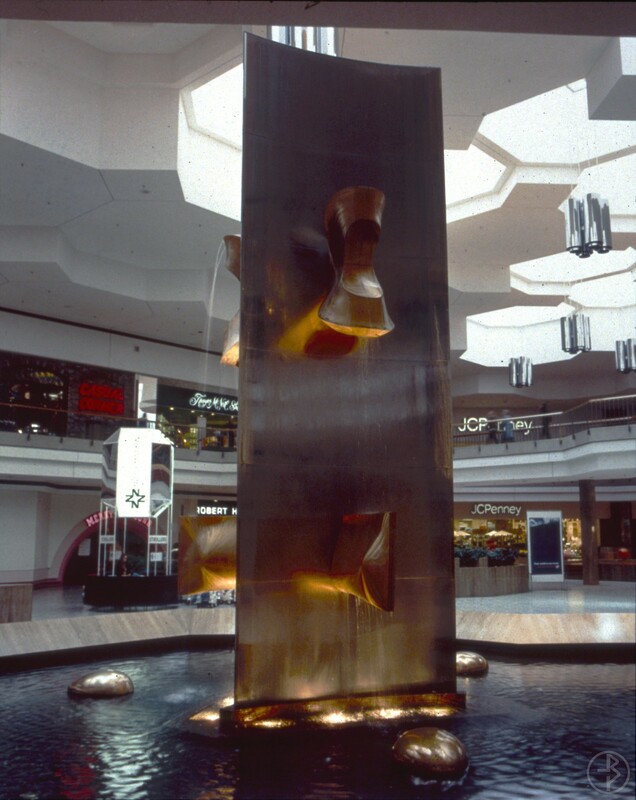 Titled, “Fountain of Illusion”, the sculpture was crafted by Harold Persico Paris during his late-life venture into metalworking and welding. All of these features would later be removed and replaced by some of the more-contemporary tastes of the 1980s, as well as an elevator to meet compliance with the upcoming Americans with Disabilities Act. 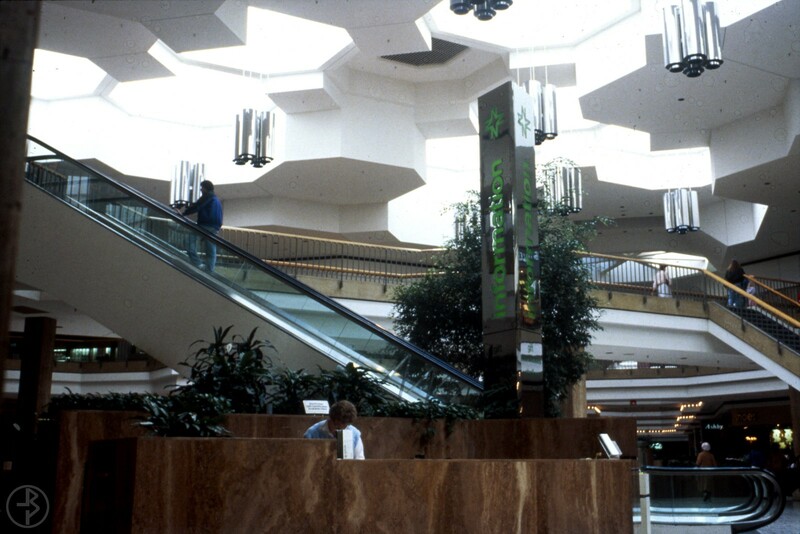 A couple of things in these last three images, all of which are from around the mall’s opening to the late-70s. 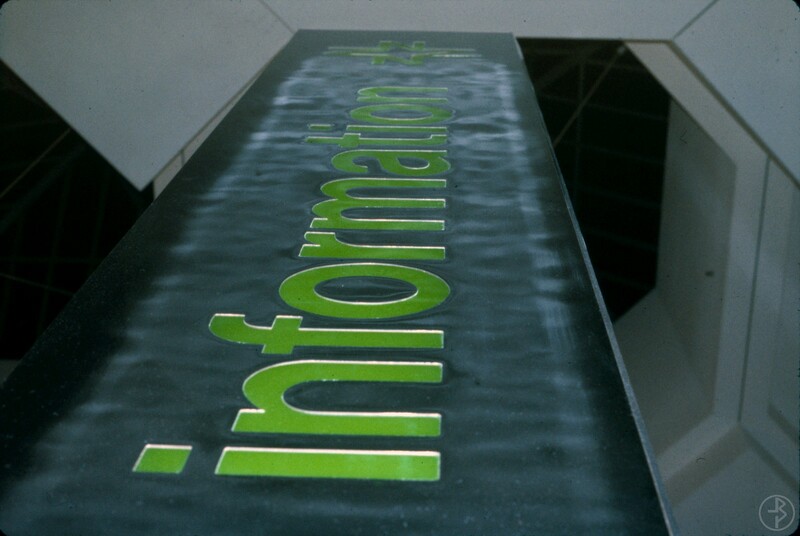 First we have two views that show the original information desk, which was eventually replaced by the more permanent-looking structure. 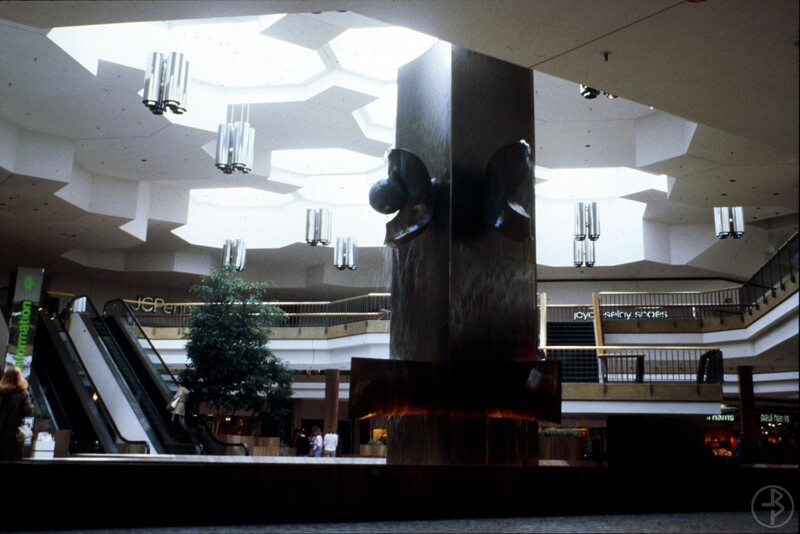 This last one shows a couple of children sharing candy in the seating area by the main stage; I believe taken around the mid-late 70s, as it shows additional lighting features in the mall that were absent by the time of the later photos. 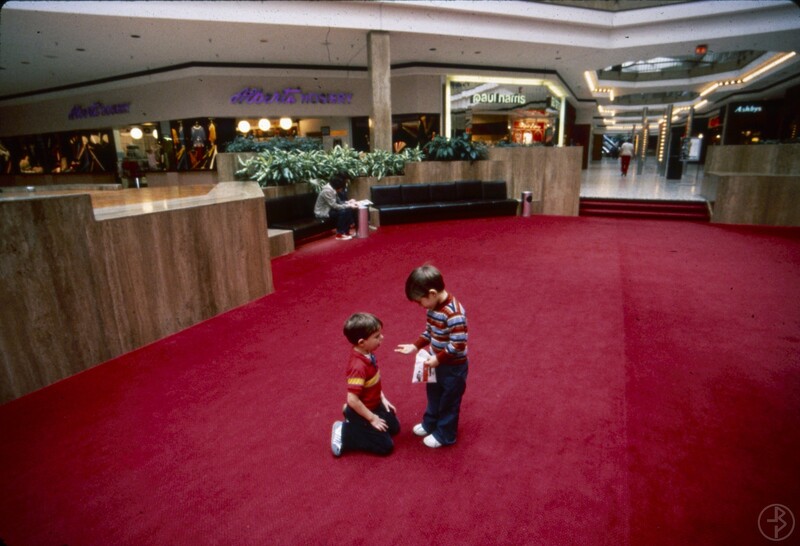 Red carpeting was also an early feature throughout the mall that was changed to green later on… probably easier to clean. 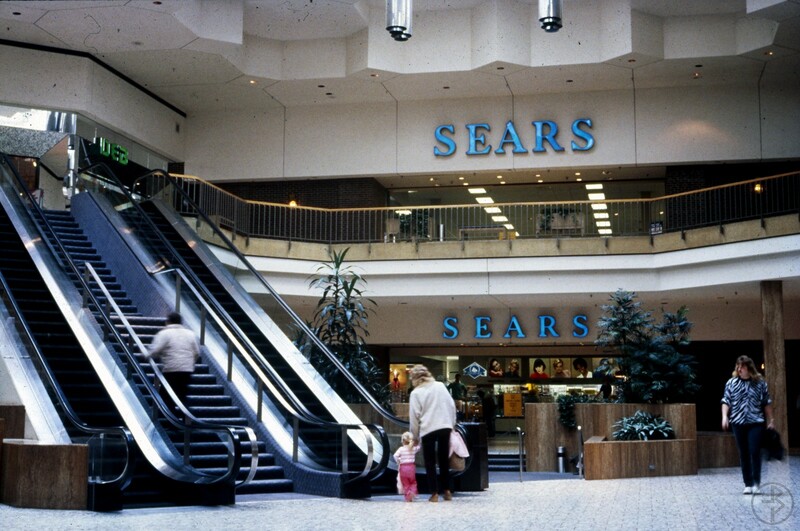 Sears was an original anchor to the mall, and the third to leave – shuttering in early-2002. 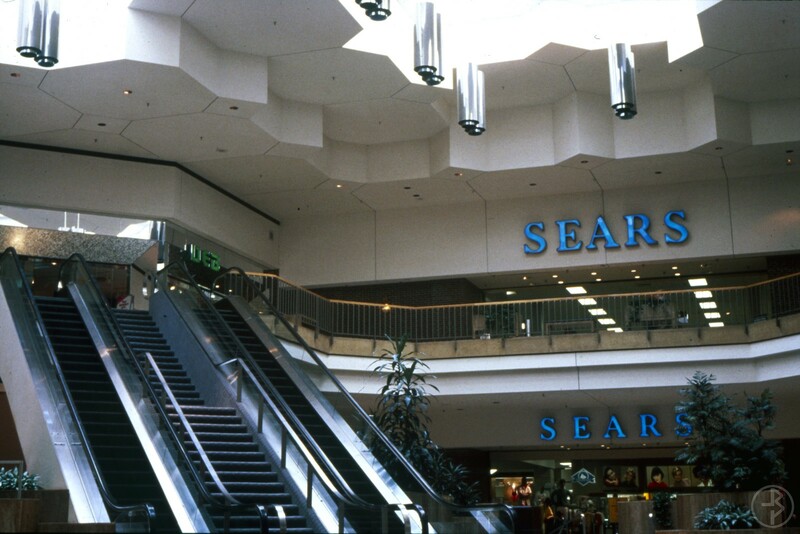 Other than a refresh to Sears’ storefront and new ceiling lighting, this area largely remained unaltered until the mall closed. It was then disfigured by Sears’ demolition and replacement by a new Menard’s. 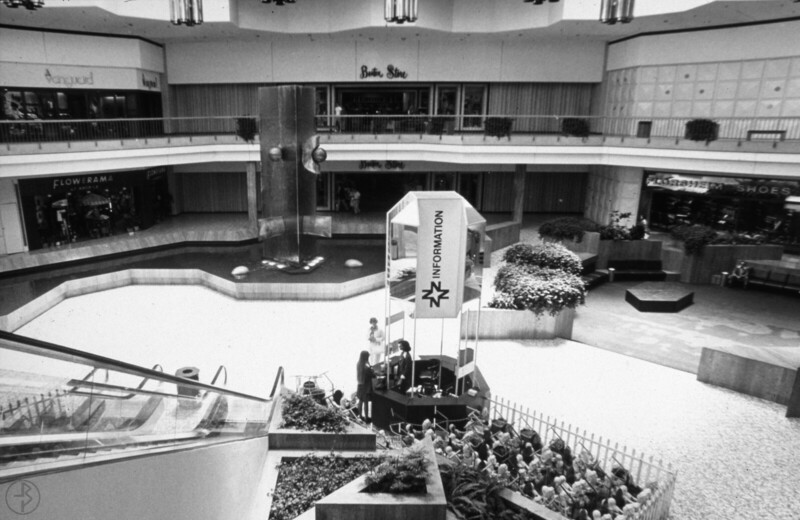 The planters, seating, a small stage, and escalator were all removed – dead-ending the mall with a floor-to-ceiling exterior wall for Menard’s. 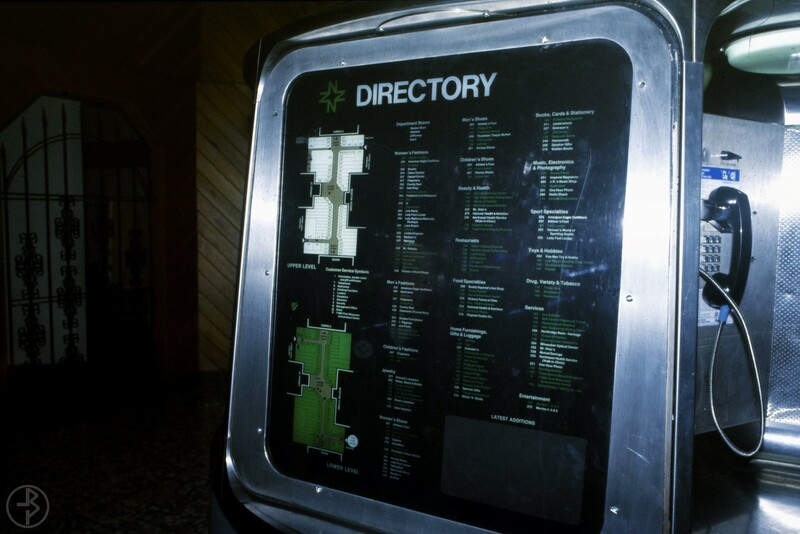 These last two images show a clear shot of the old, space-age mall directory and pay phone kiosks that were at the mall entrances – this one on the lower level was yet to be updated replacing Gimbels with Marshall Field’s. This area underwent quite a few changes before and after these photos were taken. 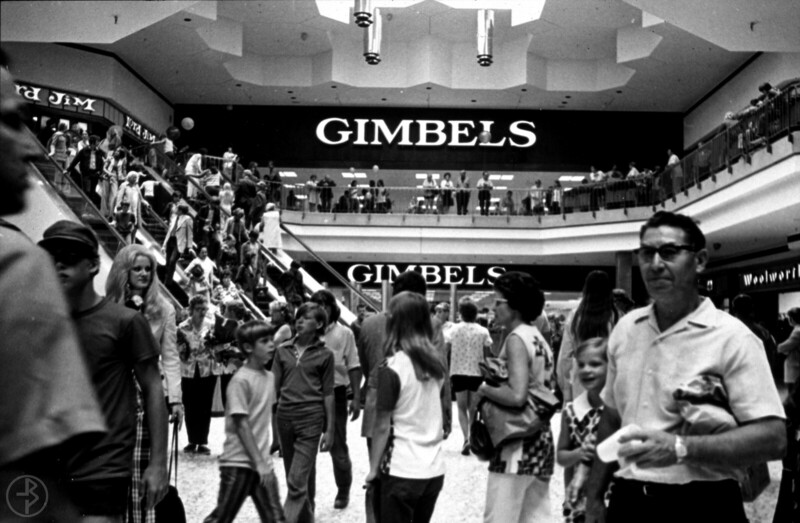 The original anchor tenant here – shown in the first two photos taken around the mall’s opening – was Gimbels, which was acquired by the retail subsidiary of British-American Tobacco (later BATUS, Inc.) a year after it opened. 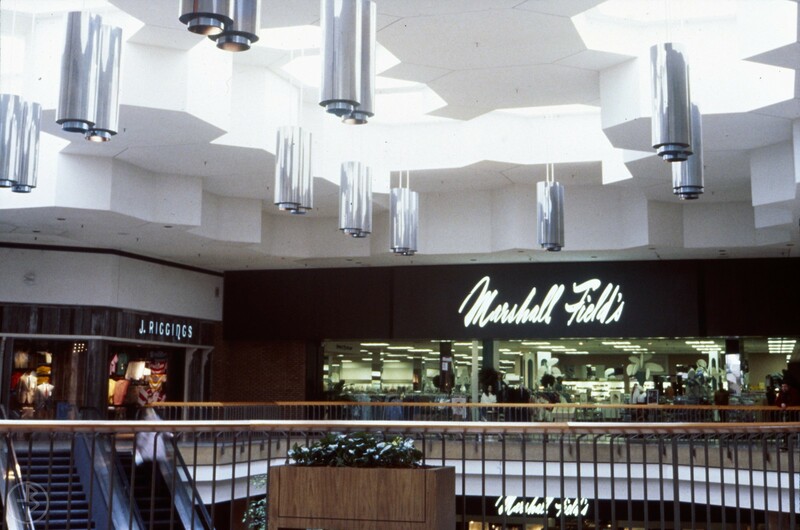 In 1986, BATUS liquidated the underperforming Gimbels chain, and handed some of the Milwaukee stores over to its Marshall Field’s division – including Northridge. 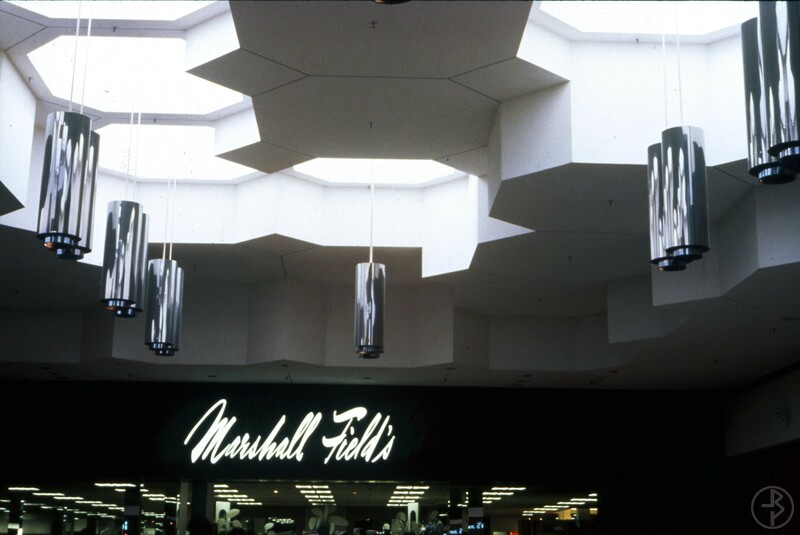 Field’s was in operation at Northridge by October ’86, but apparently found little success here versus its longstanding store at Mayfair, and turned the store over to Wisconsin’s H.C. Prange’s in early 1989. Des Moines-based Younker’s replaced Prange’s following their 1992 bankruptcy, however that chain would fall under the same corporate overlords as fellow-anchor, Boston Store, by the end of the decade. 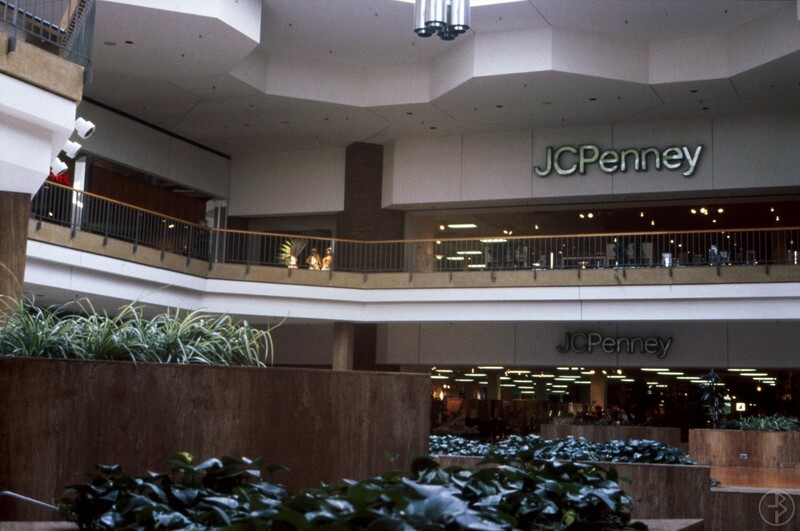 Deemed redundant, the Northridge Younkers was closed in 2000, alongside the underperforming JCPenney, which sent the mall into a death spiral from which it never recovered. 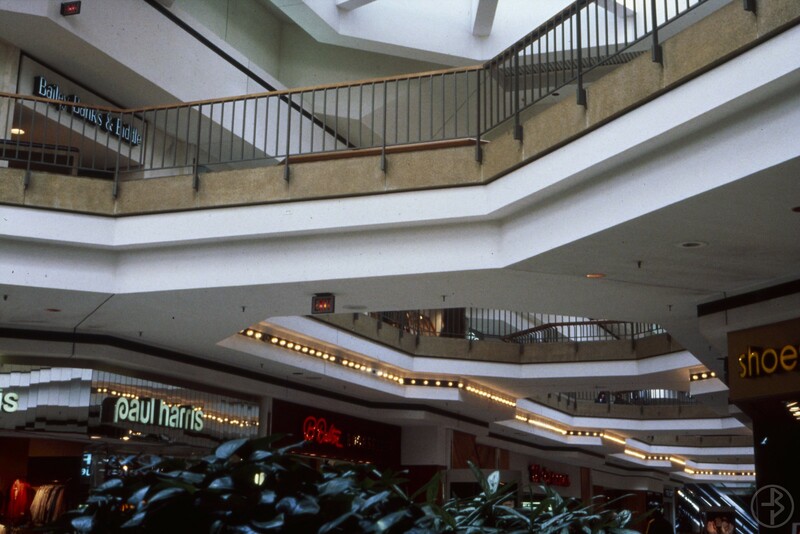 The last image in this set shows the upper level mall entrance in this wing. 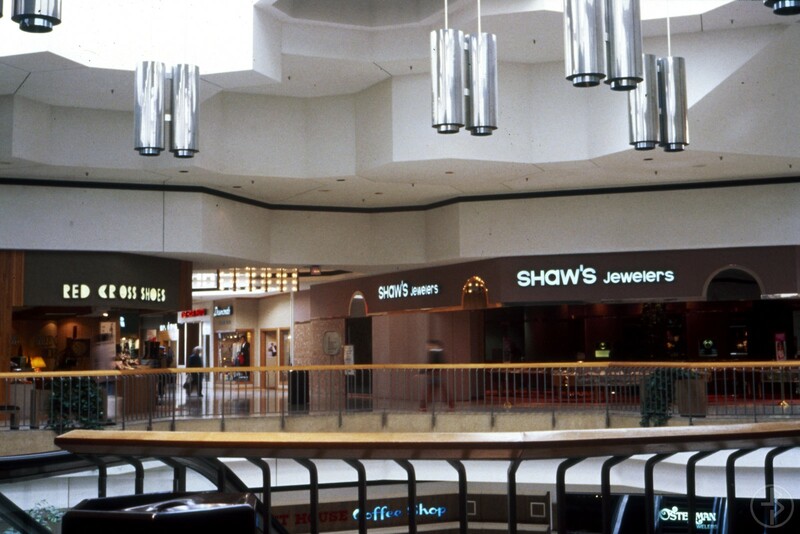 Save for Shaw’s Jewelers, this area would be gutted and completely reconfigured as the mall’s food court in 1988. 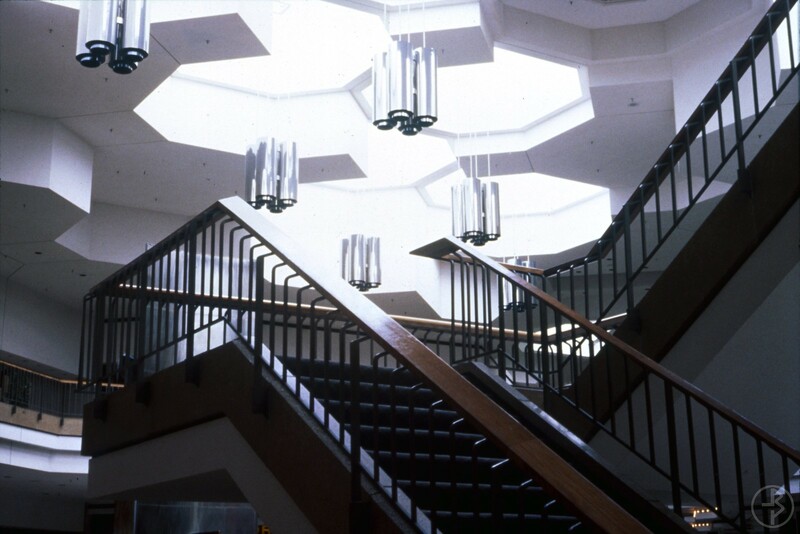 For more photographs of Northridge during, and following its 1988 renovation: click here for Part II! Thank you so much for this, I spent a good part of my life here and it’s so nice to see pictures of it full of life! Awesome photos and information! Spent many years here! I used to go there all the time in the 70’s/80’s. Was a great place until the area became thuggish in the 90’s,then there went the neighborhood,just like Capitol Court had prior. Sad!! Good times back then. WOW certainly brings back memories. I remember pushing my sons in a stroller through the mall. They are both in their 40’s now. Beautiful set of photos can’t wait to see more! Thank you so much for sharing this. 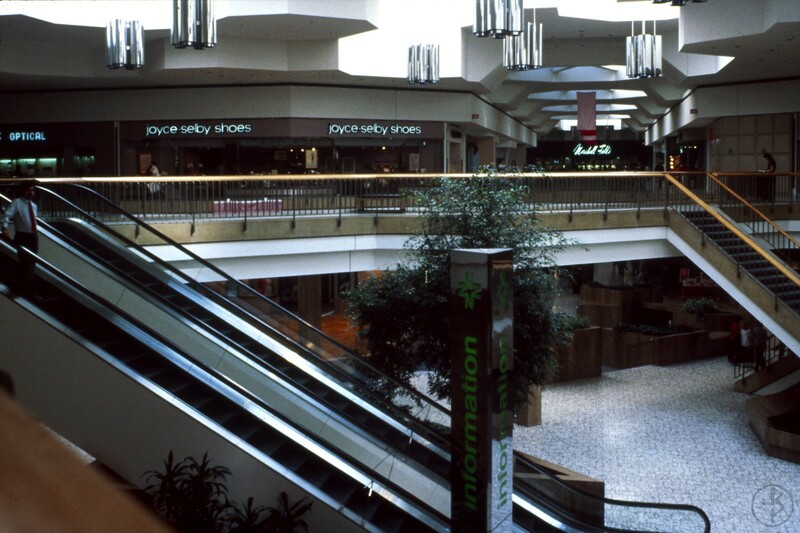 I Worked for “Kay Bee Toys ” , and just grew up with this Mall.I miss it a lot. 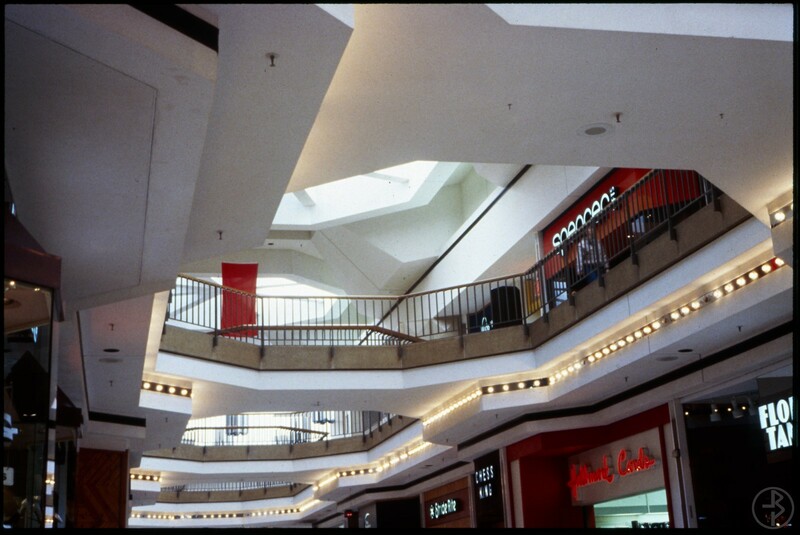 Awesome pictures of how I remember Northridge. Keep the photos coming. Great work. Thank you so much. I worked in the salon at Boston Store on the first level from 1987-1992. Haircut-7$, perm wave-7$ and style-7$! 21$ for all! Crazy! 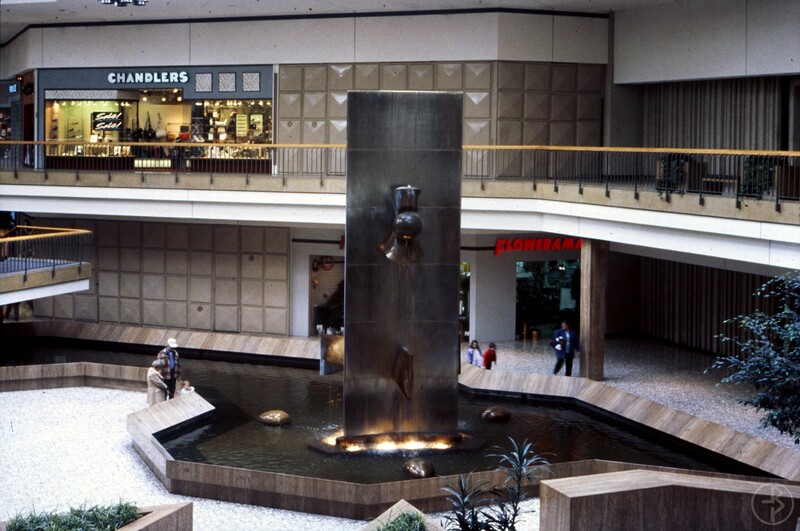 I miss the idea of that mall. Had a lot of good times there. Thanks for the pictures. This is a really great find. 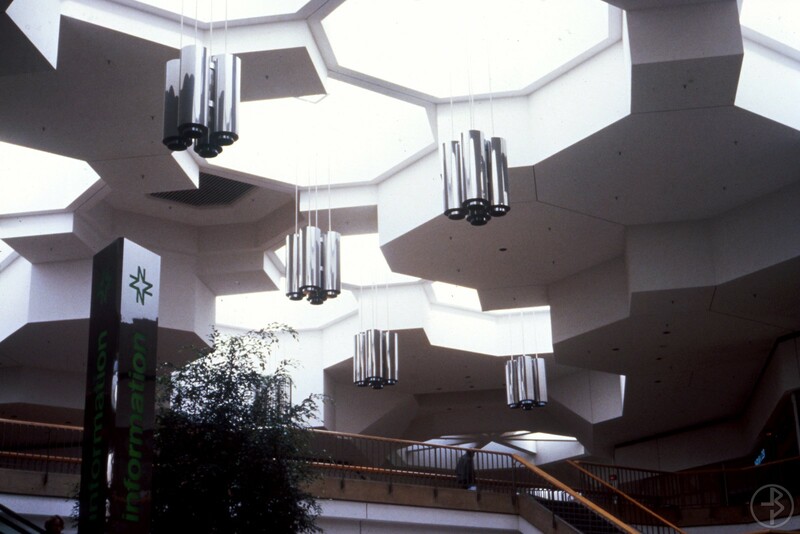 There are surprisingly few good photos on the internet of 70’s and 80’s mall interiors. I love seeing all the familiar stores, which really stand out in these pics. I’ve never been to Northridge, but I can tell it was something special. Thanks for posting. Awesome pics. Can’t wait for more! Wowwow. Loys of memories.. grew up going to nirthridge and capital court. I used to work at j.w. 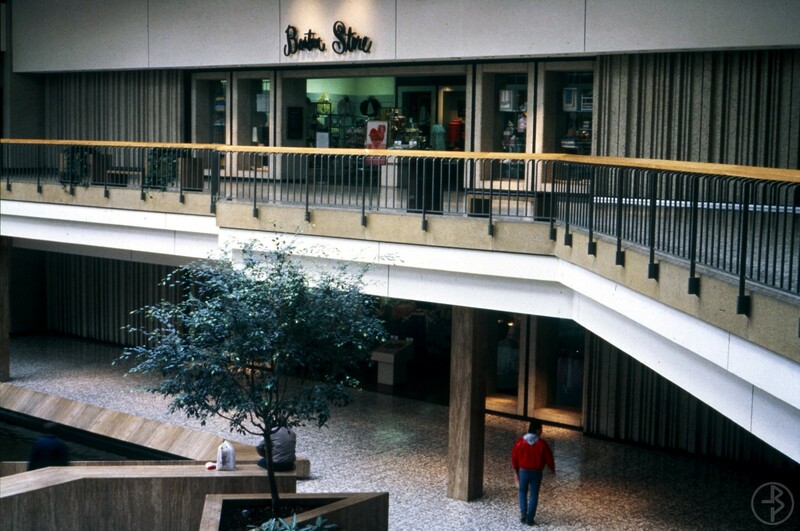 which was right next to bakers shoe store lower level by where santa used to sit..
How did you actually him access into the mall? There are sanctioned airsoft events held at the mall a couple times a year, we’ve been hitting it while they stage in the morning — usually a three or four hour window to do our thing before getting kicked out. Not how we normally do things, but there’s a reason this place has been virtually unseen for about 15 years. THANKS for sharing. I would love to get in there someday. Thank you for sharing. These pictures bring back many awesome memories of my teen years. 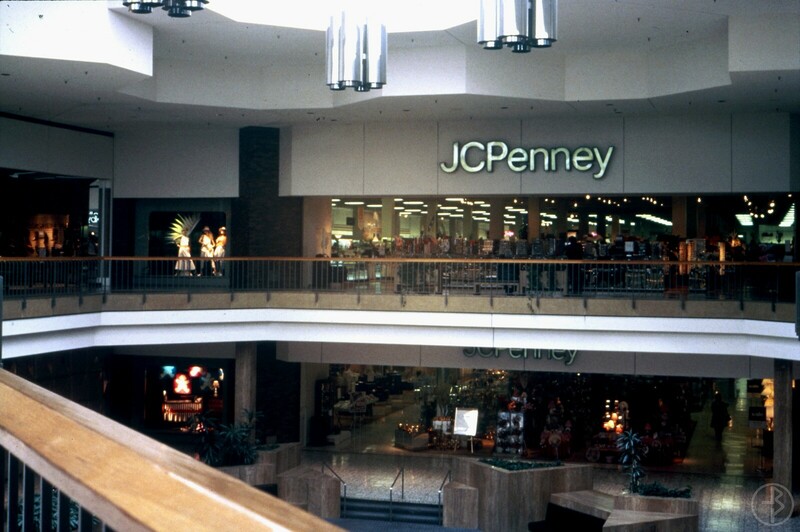 I worked at the mall in the 80’s. Gimbels and Boston Store. Great college job!! Brings back middle/high school memories of times with friends I don’t see anymore. Thanks for the great nostalgia! 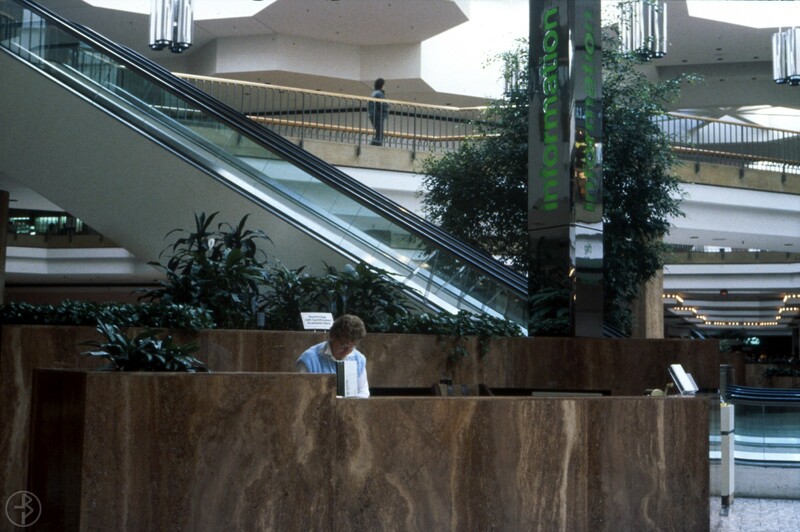 I remember the mall opening later in my high school years. We loved going there for movies and shopping. I vividly recall going to see a movie there as an adult near the end of the malls life and the halls were lined with gang members. We didn’t feel safe. Shocked me! So sad to see such an icon sitting empt for all of these years, such a waste. . Thanks so much for sharing all of this. Awesome! Great memories for all of us! Fantastic pictures. Brings back so many wonderful memories. Awesome! I am so excited to see the rest of the series! 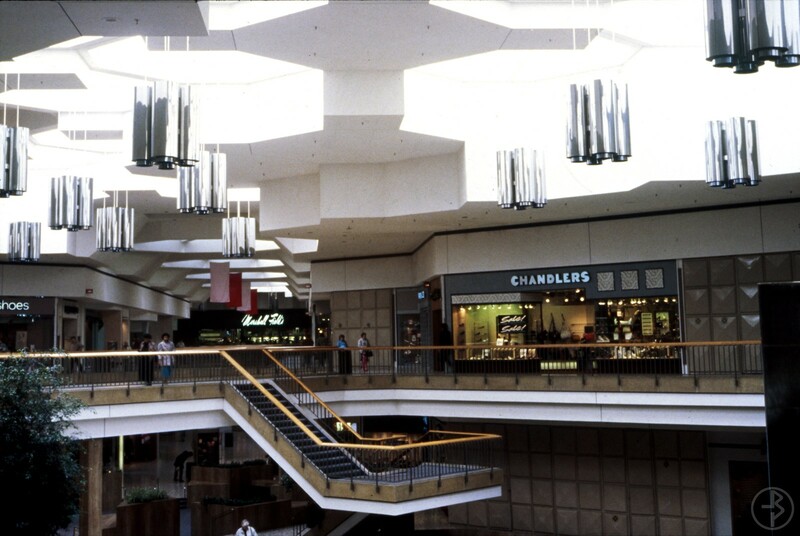 I was a little too young to fully remember the mall now but I do vividly remember getting my ears pierced at Claire’s when I was about 8 years old (maybe around ’97ish?) and then sitting on the edge of one of the fountain pools, eating a Tootsie Pop and waiting for my screaming sister to get her ears pierced too 😉 These are such great pictures! Omg! I can totally picture this too. This makes me sad but I’m loving the nostalgia. Thank you for sharing! Thank you , brings back many good memories,want to see more. Loved that mall and spent a lot of time there with my friends! So sad to see it in the shape it is in now. Thank you for sharing, what happened to Northridge and the surrounding area is very sad for me. 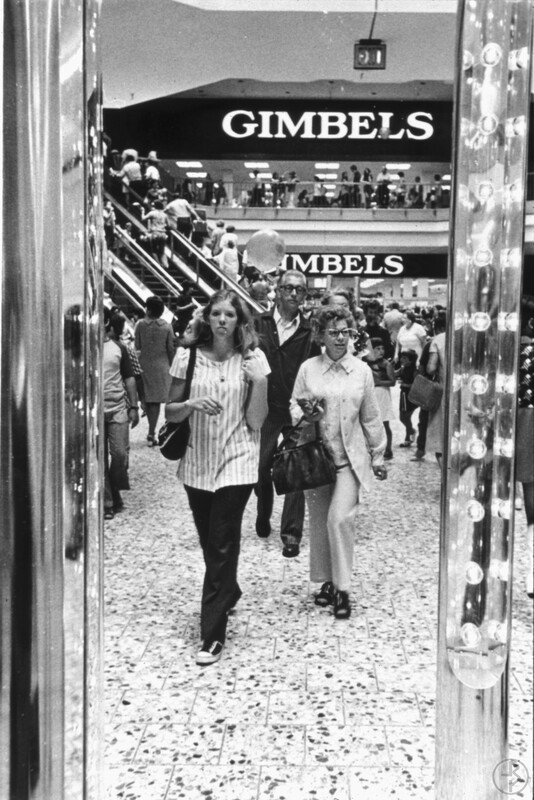 When I was little, my Grandma worked at Woolworth’s and I had the run of the mall. 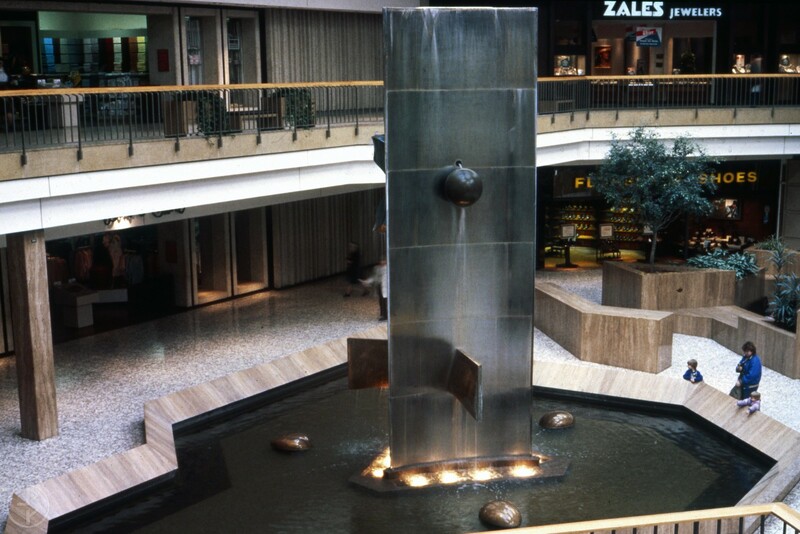 As a teenager this was the spot for dates and movies. I work in Brown Deer and frequently drive past Northridge. The whole area is virtually abandoned. My favorite Chinese restaurant is now a funeral home. ChI Chi’s, TGIF, the Office Max where we printed our underground zine in high school, all gone.